The Switch is an extremely popular console right now, so popular that it has more games at this point than the Wii and Wii U had. Combined. 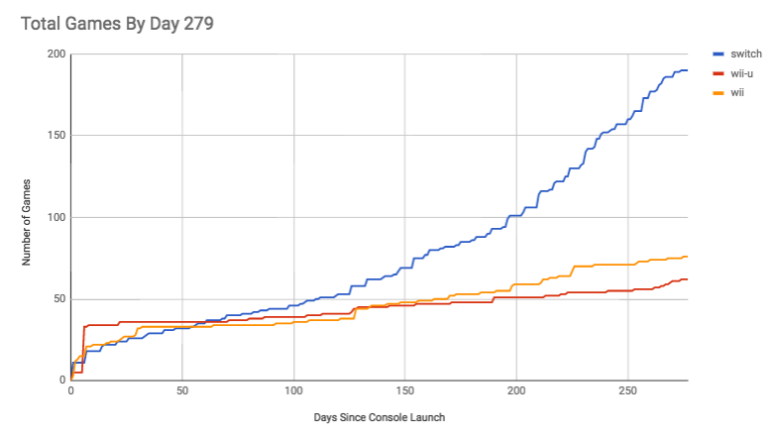 After about 280 days on the market, the Switch has almost 200 games, while the Wii had about and the Wii U had around 60. That’s a big jump in developer support. Granted, however, the Wii did not have a fully functioning eShop and while the Wii U did, Nintendo did not embrace indies as they do now. Which begs the question: how many games have you purchased on the Switch so far? Let us know your thoughts in the comments section below!